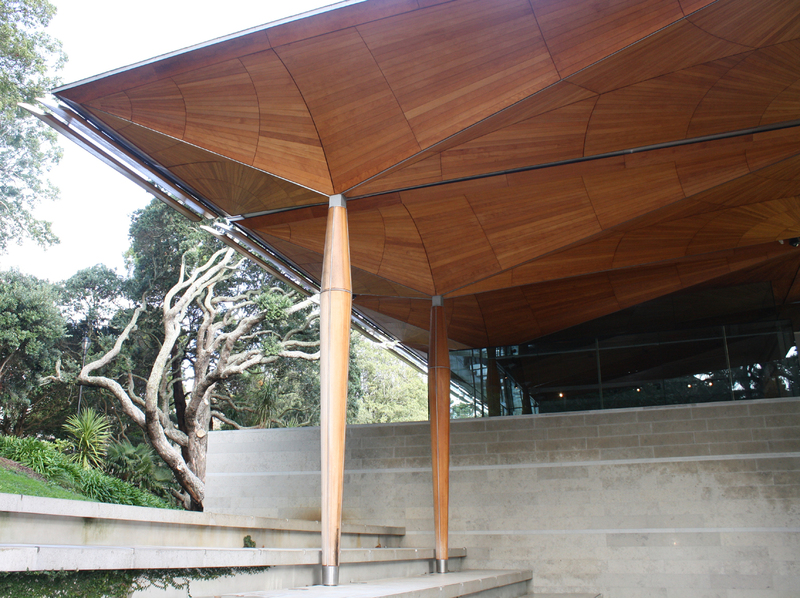 I recently had the opportunity to present a paper at the Society of Architectural Historians Australia New Zealand’s (SAHANZ) 2014 conference, held in Auckland this year. Auckland skyline. Photo by Diana Painter. This offered an excellent opportunity to share my love of Pacific Northwest modernism, meet fellow historians in another hemisphere, and of course see some of New Zealand and Australia. My paper, entitled “Regional Modernism on the West Coast: A Tale of Four Cities,” focused on the shared tenets and similar design expressions in mid-century modern residential design on the west coast of the United States, as seen in the San Francisco Bay Area, Portland, Seattle, and Vancouver, BC. (At least two attendees told me they realized I wasn’t talking about Australia when they did a mental assessment of major cities in western Australia and came up with one.) One avenue I explored in the paper, in support of the thesis, was the personal and professional relationships among many of the practitioners on the west coast at the time, which accounts in part for the spread of new ideas. Relationships between the west and east coast of the United States also helped support the spread of progressive ideas from the west. For example, the architect William Wurster, one of the most highly regarded Regional modernists in the Bay Area at mid-century, married housing advocate Catherine Bauer in 1940. Catherine’s sister assisted in curating the highly influential exhibit Built in USA 1932-1944, which was mounted at New York’s Museum of Modern Art in 1944. She also edited the catalogue. Not terribly surprising, west coast architects made a showing in this exhibit, and Wurster’s work was called out as particularly noteworthy. One of the advantages of talking about Regional modernism in other places (I also presented a paper on Pietro Belluschi at this year’s VAF conference) is that people come up and tell you about similar trends at mid-century in their own region, and this was no different. About 100 papers were presented at the conference. The theme was “Translations,” which – appropriately – lent itself to many interpretations. Within this framework topics ranged from the effects of the international spice trade of the 16th century on the built environment across the globe, to the design of new housing, post-Katrina, in New Orleans’ Lower Ninth Ward. All the papers exhibited a high level of professionalism and collectively, a broad range of interests, both historical and contemporary. Two of my favorite papers addressed the scientific iconography incorporated into biotechnology firms’ laboratory buildings (the author, Sandra Kaji-O’Grady won the prize for the best paper), and “facadism as urban taxidermy,” by Hannah Lewi and Andrew Murray. The first paper focused in part on the number of buildings worldwide that incorporate double helixes in order to [superficially] portray the purpose of the building, among other visual metaphors from the sciences. The latter paper used examples from Washington DC, Perth, and Melbourne to portray and analyze the range of feeble and/or distressingly misguided attempts to incorporate portions of historic buildings in new development schemes in the name of historic preservation and/or urban design. (We are all familiar with these. See for example George Kramer’s recent blog post on the Moore, Gerst & Barber Store, from July 19, 2014). This paper drew from a thesis by Kerensa Sanford Wood from Columbia University on facadism in Washington DC, which is well worth looking at, particularly for the typology of facadism employed in her analysis (the thesis, “Architecture of Compromise: A History and Evaluation of Facadism in Washington, DC” can be found here). Most of the presenters were academics from Australia or New Zealand and were from public universities, which prevail there, and quite a few papers were presented by PhD students. The non-academics I met were mostly architects or architectural students with a practice or interest in historic preservation. I ran into a few Americans, from the University of Michigan, Atlanta (author of the paper on post-Katrina houses, mentioned above), and Keith Eggener, our own Marion Dean Ross Chair of architectural history at the University of Oregon. Keith, who attended our conference in Salem last year, presented a paper on a Christopher Wren church that was bombed by the Germans in World War II and was a ruin. It was brought over from London and reconstructed in Fulton, Missouri, the site where Winston Churchill gave his “Iron Curtain” speech. Today it houses the National Churchill Museum. As part of the conference, I went on a walking tour of Auckland led by historic architect Tony Ward. Because Tony had worked on many of the buildings we saw, the tour was particularly insightful. Auckland reminds me a lot of Seattle, where I grew up. The weather, for one, is very similar. In was winter when I was there in early July, and the wind, rain and chilly damp was truly like December/January in Seattle. The topography is similar, as is the extensive waterfront and view of nearby islands and peninsulas. The contemporary architecture was also similar. Like Seattle, Auckland is oriented toward redevelopment and even has their own version of the Space Needle! 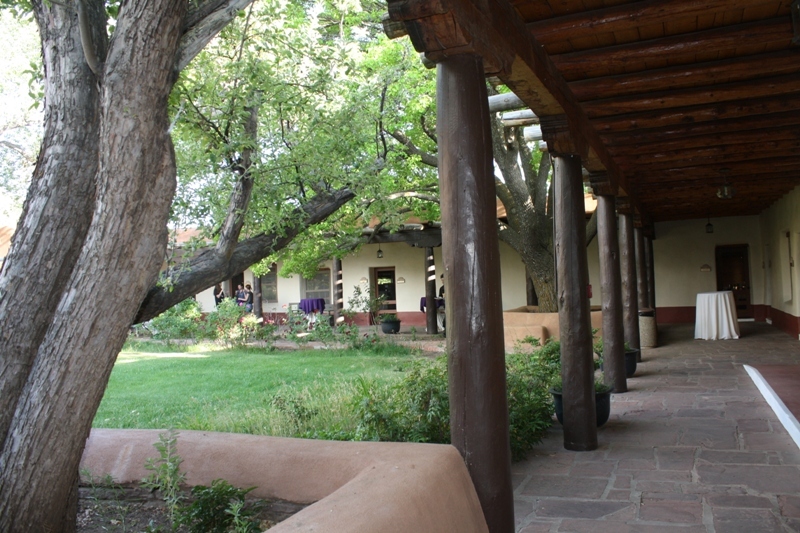 They retain some excellent parks and key historic structures, often adapted to new uses. The new addition to their art museum is particularly noteworthy. It incorporates all previous additions on a challenging site and is simply very beautiful, particularly the wood columns, part of the new addition, that recall Maori carvings in a modern interpretation. More about the prize-wining building can be found here: http://www.dezeen.com/2013/10/04/world-building-of-the-year-2013-winner-auckland-art-gallery/. A few aspects of the conference were particularly memorable, which we might take into consideration for our own conference planning in the future. 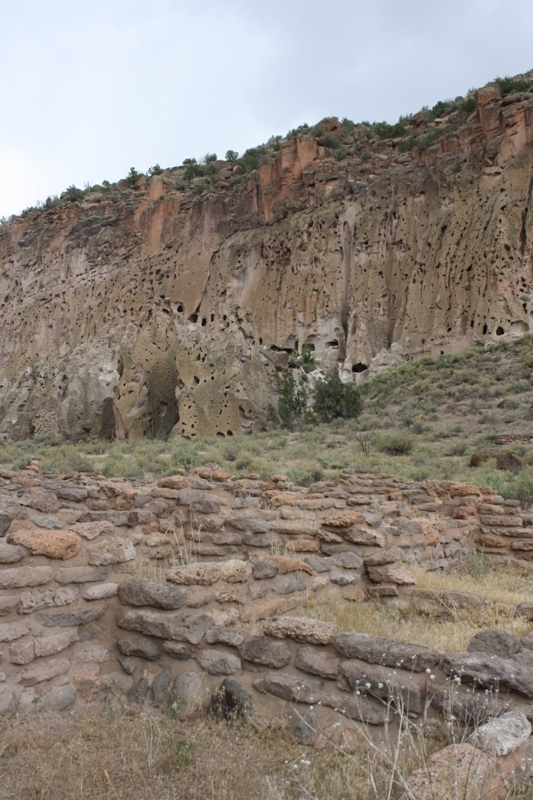 For one, the history of indigenous peoples was incorporated into the conference. In just one example, a tour of Unitech’s (the university that hosted the conference) Te Noho Kotahitanga Marae was part of the conference opening. A Marae is like the long house associated with the Pacific Northwest tribes, but in addition to exterior totems and carvings, the interior includes elaborately carved posts and colorful woven maps that tell tribal stories. A special welcoming ceremony, performed by Maoris and members of the university who spoke the Maori language, was part of our visit (an interesting side note; signage in Auckland appears in English and Maori). Secondly the food was excellent and wine and beer was freely poured! This may not be everyone’s top priority, but it certainly does enhance the atmosphere and makes for livelier conversation! 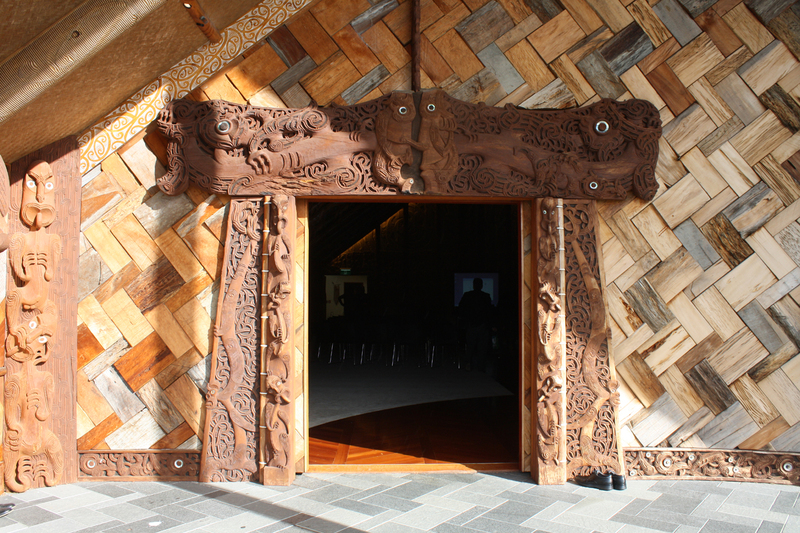 Entrance to the Marae on the Unitec campus in Auckland. Photo by Diana Painter. Here are a few terms that may be important to know for anyone attending an architectural history conference in New Zealand or Australia, for future reference. How are you going? = How are you doing? Pivoting glass louvers – jalousie windows.